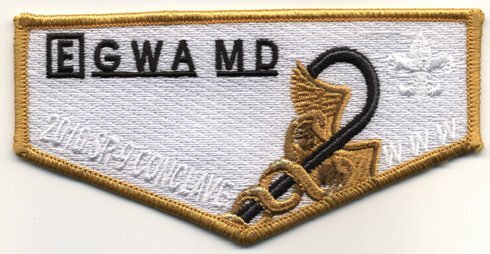 None of the patches below are medical staff patches. They have a significant medical theme. As such I have included them in my collection. They include Order of the Arrow flaps, council shoulder patches, and Jamboree items. At the National Order of the Arrow Conferences, Founder's Day is where many lodges set up booths with giveaways usually related to their lodge or state. 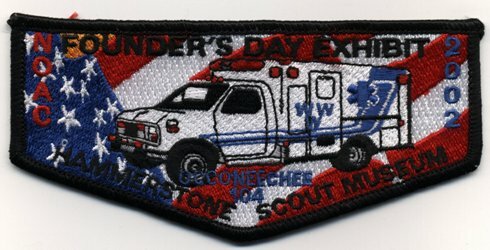 At the 2002 NOAC, Occoneechee Lodge #104 from North Carolina had an emergency services theme relating to 9/11/2001. There are three various emergency service flaps with one chevron to go under all three. This is the ambulance flap. Eswau Huppeday Lodge #560 from North Carolina has issued a lot of lodge flaps for the annual dixie conclave, often with popular culture themes. The one from 2005 is clearly based off the movie and TV show MASH. James Flatt, MD, is a urologist in Alabama. He is also very active in Scouting in general and the Order of the Arrow in particular. 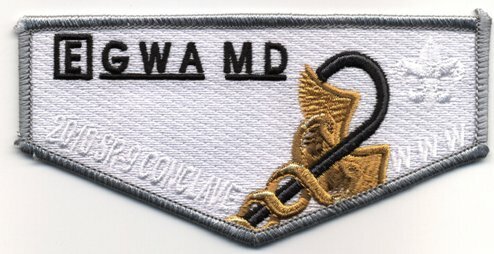 In 2009 he was awarded the Distinguished Service Award, the highest award the Order of the Arrow can issue. 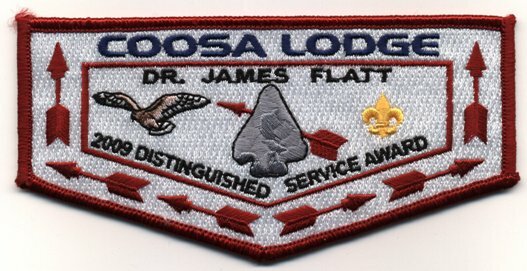 His lodge commemorated this honor with this flap. 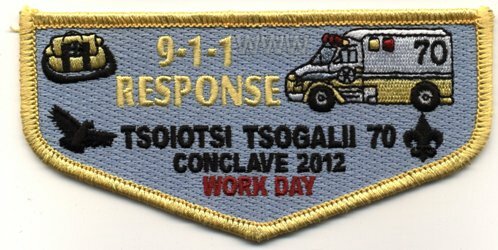 Tsoiotsi Tsogalii hosted the section SR7B conclave in 2012. Their theme was emergency response and included flaps with a police car and a firetruck on it. This is the red border ambulance issue. This is part of the same SR7B 2012 conclave as the flap above. This is the yellow border ambulance issue. The red border was earned by working at one of the work days. The yellow border was earned by working at three work days. Since at least 2006 Buffalo Trail Council has issued a council strip for its distinguished citizen. In 2007 that citizen was Midland, TX orthopedist Charles Younger, MD. For the 2005 National Jamboree the Baltimore Area Council created a set of JSPs with the theme "Baltimore in Action". This one shows a pre-hospital setting. For the 2005 National Jamboree the Baltimore Area Council created a set of JSPs with the theme "Baltimore in Action". This one shows a hospital setting. For the 2010 National Jamboree the Northeast Illinois Council produced a set of JSPs revolving around the different program areas of summer camp. This was the one produced for the medical lodge. In 2005 the BSA named the National Jamboree subcamps for various explorers, and this included people of various professions, including physicians. Subcamp 5 was named for Michael Manyak, MD, who is a urologist and whose biography includes serving as medical officer on an Antarctic expedition. In 2005 the BSA named the National Jamboree subcamps for various explorers, and this included people of various professions, including physicians. Subcamp 18 was named for William Forgey, MD who is a family physician who has written many books on travel and wilderness medicine.